This page was edited to reflect current character design on January 20, 2017. 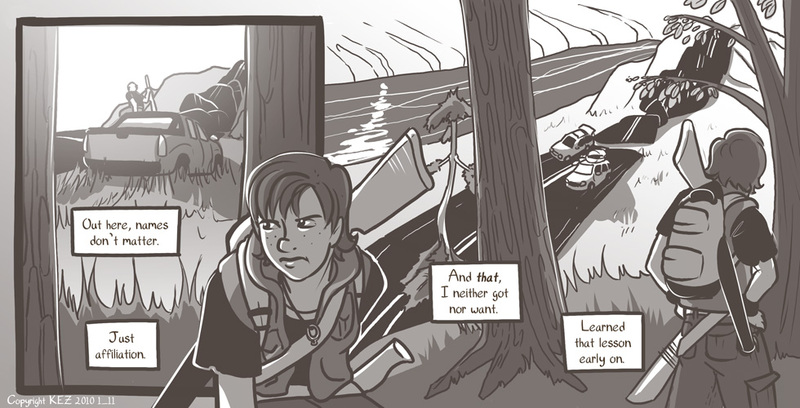 SpiderForest comic of the week is a new arrival to the network: Scattered Leaves! This wonderful hand-drawn comic follows the story of a young girl, who after a very tragic ordeal, chooses to grow wings! The price of her new gift however, is her memories--the good and the bad. Awesome premise, check it out! I apologize this comic is so late! It was done, but my internet was out! Some jerkass had put a "trap" on my cable outside that blocked all internet to my apartment only. The cable guy said some lazy internet fixer person had probably botched a job previously. Excuse me while I sharpen my knife and think about what I might do to this person should I ever meet him/her. Anyway, the strip is up now! And a new one will be up tomorrow as well, no worries. So, continuing this intro arc, here's a little more about Colbey's life. She doesn't have an "affiliation," whatever that means. I suppose it might be important and stuff. Just a little bit. Or perhaps it could be the crux of the story, who knows? Why does Colbey avoid other people? Has she had a bad experience? Is she just anti-social? Did she screw someone else over royally and now is cautious to run into affiliates of this old enemy? Oh my, that last one was like an overly-detailed answer to a multiple choice question, where even if you didn't know the answer, you'd choose it because it SOUNDED right. Ahem. Not much to say today! If you have a sec, please take the time to fill out this short survey for me please! Thanks. Exam on the morrow, much studying left to do. Wish me luck!